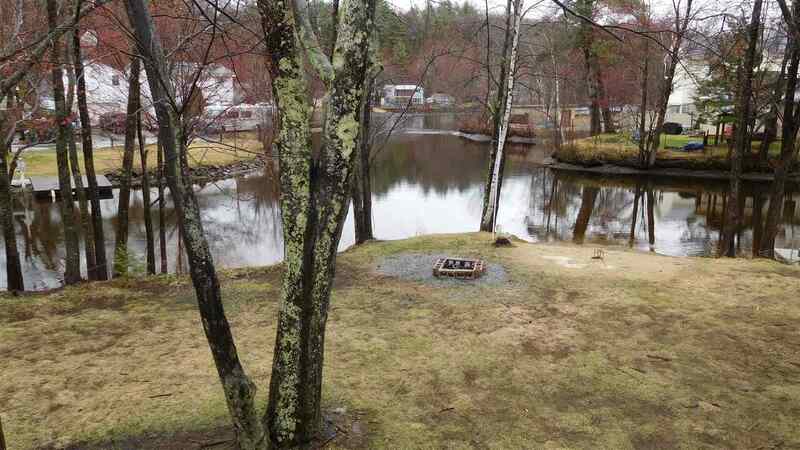 150 feet of Water Frontage with dock and small beach area! This raised ranch is surrounded by water on three sides nestled at the end of the land. Water Views from all windows, save two! Generous room sizes plus a great floor plan for entertaining. Updated Kitchen with stainless steel appliances. Living Room has a fireplace with a wood stove insert, focal wall with ambient lighting. Over sized office or sitting area leads to the deck. Master Bedroom has two closets, one a deep walk in....plus a bathroom large enough to contain washer and dryer. Two additional bedrooms flank the hall bath with an extra deep soaking tub. Walkout basement has tons of storage, a high ceiling and plenty of daylight. Property was lifted and elevation certificate available to allow for reduced flood insurance cost. Shed for all the extras, play set, and structure to hold the firewood. Plenty of parking and one car garage under. River living at it&apos;s best.